In a strong, undeniable way, director Spike Lee’s BlackKKlansman is his accusation that few of us understand the depth of racial segregation as it exists today. This isn’t a story set in the distant past. It begins in the 1970s, a time when much of the populace assumed slavery and segregation were over. Spike Lee’s movie is a sharp reminder that what we thought had been accomplished had simply gone underground with progress confined to liberal areas in the Northeast and far West. This movie is an attack on our ignorance. Slavery may be over; segregation isn’t. Adam Driver plays Flip Zimmerman, a Jewish cop who has to hide his own feelings as he assumes the identity of a right-wing bully in order to enter the Klan. He must listen to fellow bullies spout their certainties – “I’m a white non-Jewish American citizen.” And there Flip stands, wearing the hood of the Klan. He endures all the indignities of pretending he is a segregationist bully while his new partner, Ron Stallworth (John David Washington) can only work from the office because he is black. He delivers Flip’s white telephone voice in their joint efforts to expose the Klan. Laura Harrier plays Patrice Demas, a firm opponent of the segregationists who, rather than discuss the problems with her new friend Flip, lectures him from her righteous position. The story is Spike Lee’s way of delivering the message that while many of us believe that changing laws has changed behavior, the reality life for a black person walking down a street is still frightening. Hands out of pockets, silence, no reactions, no sudden moves. As Flip and Ron become the team that delivers both the nuance and the ugliness of this story, it would be hard not to sink into some level of fear, guilt, and confusion, living as we do in a world where so much is still unfair. Their acting is so good that their story hits us with the sharpest edges of accusation. Topher Grace creates the Klan’s Grand Wizard with calm born of his total commitment to the consuming hatred that has become his core. 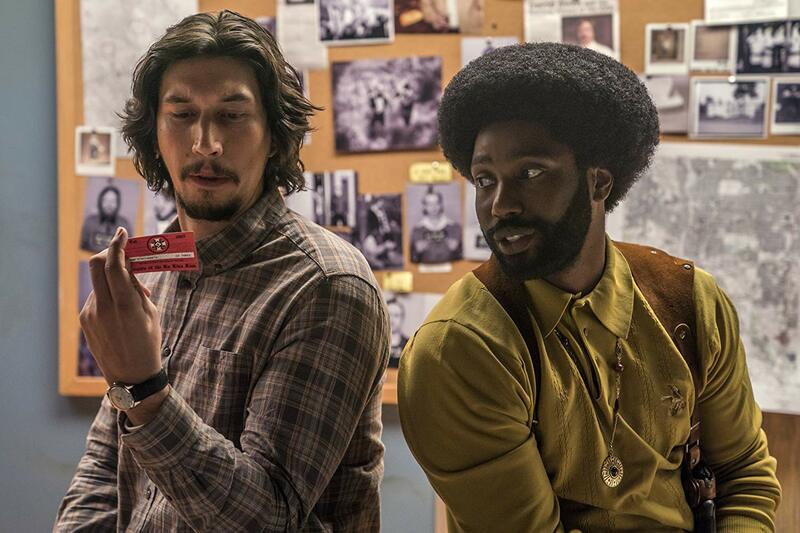 BlackKKlansman is both serious and provocative. It comes from Spike Lee as a command to reexamine our own beliefs and actions. When, near the end, he jumps into present day politics, the movie acquires even greater force. There is no question that the depth of feeling in the audience at the close is due to the uncanny way Lee forces us to sink into this continuing problem of our own creation. He doesn’t allow us for a second to retreat to believing the job had been done with the passage of anti-segregation laws. His power comes from skillful use of a fine group of actors to examine the problems as they exist right now. The depth of feeling as the theater empties is due to Spike Lee’s uncanny skill at pulling everyone deeply into this continuing American problem of our own creation. This review was posted on August 19, 2018, in Biography, Comedy, Crime. Bookmark the permalink.